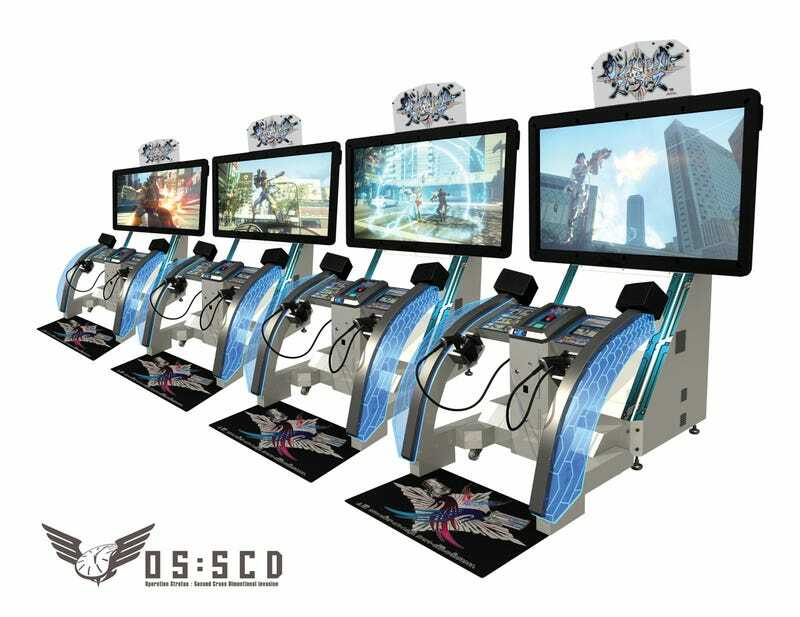 Gunslinger Stratos is a four-versus-four third-person shooter for Japanese arcades made by Square-Enix. But it's not just your average TPS team deathmatch arcade. It's also a lightgun game—a dual wielding lightgun game at that. But the gimmick goes so far beyond simple dual wielding. To switch between your weapons—which range from pistols to gravity guns—you have to combine the two pistol controllers in your hands into different configurations. And with the ability to fly around and destroy some of Tokyo's most famous locations in the crossfire, it really is a hectic and amazingly fun experience. Wonder how exactly it works? Well check out the video above where, on location in a Japanese arcade, I explain what's going on and then show you how it plays. (Sorry in advance for the background noise—it's an arcade after all). Gunslinger Stratos was released in Japanese arcades on July 11, 2012. There is no word on an international release.